4 Climbing log entries Found. I had already done Mount Colvin via the Lake Road in an earlier outing. But at the time I was not actively pursuing my 46er quest, and so did not bother to summit Blake at the same time. So... this weekend we decided that maybe we should get it done. Initially I wanted to do a 2-car point-to-point affair from Elk Lake, over the Blake-Colvin ridge, and down and out the Lake Road, but there were only three of us hiking this weekend, and there was little support for the idea. So we decided to repeat my original Colvin hike and hike just a bit farther to bag Colvin. It was a beautiful late summer day, and after signing in with the white-bearded 'entrance guard', quickly made our way up the Lake Road. We decided to indulge ourselves of the excellent views from Indian Head and the Fishhawk cliffs even though that meant an extra bit of a detour. 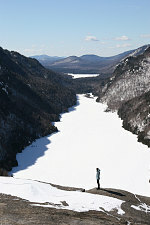 It was well worth it, and we had an excellent lunch break atop the Indian Head cliffs, with Lower Ausable Lake spread out below us. 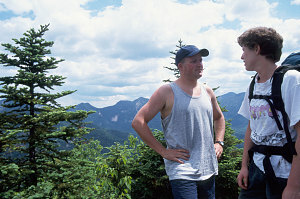 From there we toiled up the ridge to the summit of Colvin, with its little summit area providing the usual excellent views in almost all directions, especially towards the Great Range and down to the Lake. Next was a somewhat tiring and sometimes treacherous hike over to Blake. Blake's summit is one of the less interesting in the Adirondacks, with basically no views to speak of (and no summit sign - I had to continue down past the summit just to be sure we got it). Our mission complete, we headed back along the ridge and over Colvin again (guess I can't count that as another summitting of Colvin, can I? ), and then down to the Lake road and out for the day. This was Sophie and Lorraine's first hikes with us in the Adirondacks. I had never been to Indian Head or Colvin, and so looking forward to seeing some new terrain. We started off from the AMR club and walked up the lake road all the way to the lake. From there, we veered left onto the trail heading up to Indian Head (I realize now that this route is not part of an official DEC trail). Lorraine, having not really hiked before, was wearing nice shiny new sneakers, but she was managing well nevertheless. 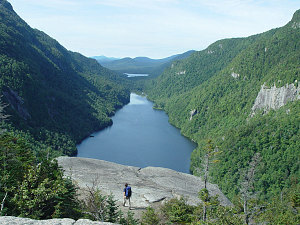 Soon we were atop Indian Head - quite a fantastic viewpoint (one of the better in the Adirondacks), with the long narrow fjord-like Lower Ausable Lake sandwiched between Colvin and Sawteeth. From there we headed down steeply to rejoin the main trail heading up Colvin. A pretty reasonable trail, with very few rocky bits. The summit of Colvin, although treed, does have a very excellent little flat platform of rock that you can stand on that gets you out of the trees enough to give spectacular views straight down to Lower Ausable Lake and of the Great Range. Markus used his Brother's RIM Pager to send e-mail and unix commands to his linux box from atop the summit - he really impressed the girls with that! :-). After a good lunch break, we were headed back down the mountain, this time avoiding the Indian Head detour. Returning to the Lake Road, it was then an easy stroll down to the AMR club and beyond that to the parking lot.